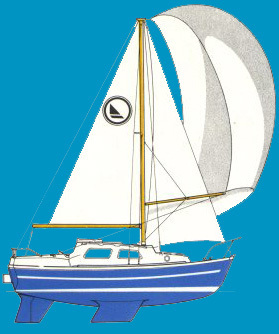 ”Valkyrien” is a sailboat of the brand Leisure 22, which is produced in 1976. 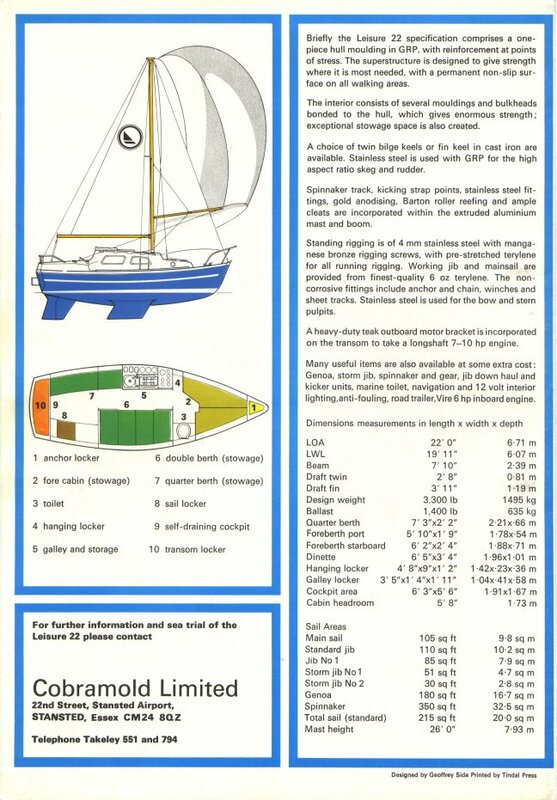 The boat measures only 6,7 meters and is not a large sailboat, but has a very solid English construction. She has an uncommon interior design, with the benches perpendicular to the longitudinal direction and large windows. I find that very practical because you get a very good view in contrast to standard sailboat design. 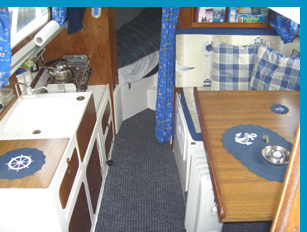 The boat is big enough for one to maximum two persons, at least on long journeys. Time will show if she suites the job as long-distance sailor. She is very safe and comfortable to sail. There is 43 % keel weight, something that makes her stiff even in rough winds. The total weight is 1 500 kg, and is 2,39 meters wide. The cockpit is deep and wide, with 2 meters long benches. Compared to the size there is very much place of cargo compartments, something that is important on such a long journey. Some reinforcement has been made before the journey started, so she is safe to use on the open sea. There is published some pictures of her and on www.sailguide.com you can find information about a variety of sailboats, including Leisure 22. On the stern there is mounted a two-stroke outboard engine of the brand Suzuki. It is a 1996 model which produces 6 horsepower. I hope to get hold of a bigger engine before departure. It is mounted a 55 litre gasoline tank in the stern cargo compartment. The mast is original and is probably the part of the boat that needs to be threaded with most care, since it is becoming fairly old. The mast makes the boat a total height of 7,93 meters. The boat is equipped with brand new sails which are delivered from Doyle-Lyngør sail producer. 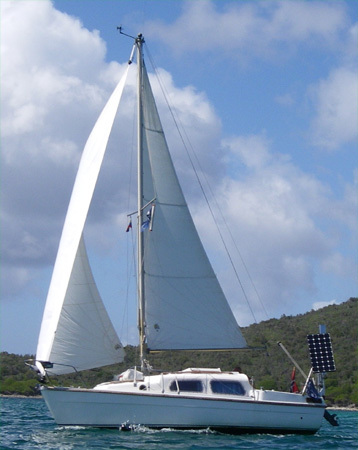 The main sail is able to be reefed in at a rolling boom. The genoa is fastened on a Seldén roller furling. Additional I am counting on using a gennaker which is hoisted up in a stocking, something which makes it very easy to handle. I will also bring an extra genoa which is used when spreading two headsails on the head furling and that also will be functioning as a spare sail. The last sail I will bring is a storm sail which is tread over the roller furling when the genoa is rolled inn. There will of course be brought plenty of ropes, blocks etc. I have mounted a laptop on board where I have installed a complete set of digital detailed sea maps covering the whole world. It is also connected to a GPS antenna. For security reasons I will also bring paper maps and pilot books, because you never know when the electronics will fail. I have an integrated depth finder and GPS antenna with colour display which again is connected to a VHF. For additional safety I have a portable GPS. Another depth finder is mounted to seek in front of the boat, to be used on shallow water. In case all my GPS equipments will fail I will bring a hexagon. Compass is mounted on the bulkhead. I will of course also bring all the necessary equipment for map navigation. A brand new VHF with a large display is mounted in the boat. It is connected with a Navtex antenna, which make it able to download emergency messages and weather reports. I am also on the search for an amateur radio. 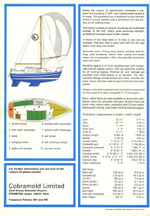 Wind rudder is a must and is mounted at the centre of the stern. It does not need electricity and keep a steady course even in high sea. A unique equipment which many refers to as an additional crew member. I will also bring the autopilot “Aurora”, an Autohelm 2000 which I intend to use while entering harbours with use of the engine. I have mounted a wind generator at the stern, a Rutland 913 that is quiet and of good quality. It produces 90 Watt with wind speeds of 10 m/s, which means 7,5 ampere. With wind speeds at 5 m/s it produces around 3,5 ampere. It will probably produce the most of my electricity needs. On the roof I have mounted a solar panel which also produces a fair share of electricity, up to around 225 Watt (around 17 ampere) per day. When I am at harbours with available power supply I have a 230 volt charger which produces 30 ampere. For the time being I have a battery capacity of 200 ampere, but I will probably increase the size underway. I will try to stay at a minimal consumption of electricity; the biggest users will be the autopilot and the freezer. The laptop will also need some and I have mounted a 12 – 230 volt inverter to suite the voltage need. To keep track of the consumption I have installed a “battman”. This will count the amount of amperes per hour spent at the present time, and the voltage on the batteries. If the batteries receive more than it gives the “battman” will also show how much ampere is charging the batteries. I have a bag packed life raft to be used in an emergency. A survival suite from Helly-Hansen is also packed at an easy available site. Safety lines along the deck with lines fastened in a safety strap will be frequently used, since most of the journey will be solo sailing. Distress flares, life buoy, fire extinguisher, life jacket, survival suite, grab-bag etc. is of course necessary equipment that will be present. Two Fortress anchors is brought. One is a FX-7 with a weight of only 1,8 kg, and the other is a FX-16 with a weight of 4,5 kg. These are very good anchors. The small one will be used at quiet anchoring places with sufficient supervision. For longer periods and places with possibilities for strong winds or oceanic currents, and times when I will be longer periods a shore, I will use the large one. I will plan to only use chains, 5 mm thick and 50 meters length. I have some spare rope that can be used as an extension if needed. Fenders, ropes, fender plank and sea anchor will also be brought. This is probably the equipment I have spent the least amount of my preparation time on. I have to figure out much along the way. There will probably be much unilateral food on the longest crossings, like beans and rice with different kinds of gravis and seasoning. It is important to be aware of getting enough vitamins, minerals, proteins, fibres etc. so I have made a deal with the business Herba-Life. They will provide me with different shakes to be used as food supplement. The shakes also function as an adequate meal, something that is usefully on distances with rough weather. This because it is very easy to prepare the shakes, you only mix the powder and water and the meal is ready. For the periods with inshore sailing I will guess there will be no challenges with food. A brand new 24 litre freezer is placed on board. It consume minimal with electricity and is estimated to be “running” 24-7. In the galley I have a stirrup pump for freshwater with water tanks holding a capacity on 100 litres. A hand pump gives unlimited amounts of seawater. I will be getting hold of a water maker which will produce up to 125 litres a day with a speed of 5,5 knots. It start to produce when the speed exceeds 4 knots. For cooking I have mounted an Origo 3000 with swing suspensions that have two plates. It uses methylated spirit and can provide up to 2000 Watt and will on max power consume 1,5 litre methylated spirit on 4 hoers. A digital wind gauge from Silva shows wind directions and strength. There is fairly new pump toilet with a small septic tank. I have a good waterproof binocular with integrated compass. Everything of spare parts to every thinkable reparations and maintenance is brought along. Diving masks and snorkel is good not only for pleasure, but also for hull inspections. Bimini, rain collector, guest flags, hammock, fishing equipment, rubber boat, flash light, radar reflector, eating equipment, climbing strap for the mast, an extra methylated spirit cooker, barometer, boathook, ropes, buckets, camera, suntan lotions, soft plugs, outboard shower, waterproof bags, tarpaulin, harpoon, etc., etc., etc.